Every patient encounters truly unique challenges during their personal medical journey. Many difficulties, however, are shared by those battling the same medical condition. In these cases, learning from the experiences of other individuals can be a powerful source of support in times of need. The founding story of the Rector Diabetes Education Center exemplifies this principle perfectly. After toddler Rhett May was diagnosed with type 1 diabetes, his grandparents Jacque and Kelly Rector funded the creation of the Center in order to educate the families of children at risk for or diagnosed with diabetes. By increasing the accessibility of health information and teaching dietary skills, the Rector Center has leveraged the personal experience of one family in order to help others navigate similar paths. To maximize positive health outcomes, Health Facilities Group designed the Labette Health Rector Diabetes Education Center to function at the vanguard of educational best practices. While a typical learning environment is geared exclusively towards either juvenile or adult audiences, this education center fosters learning for all ages by offering a diversity of services and teaching approaches. 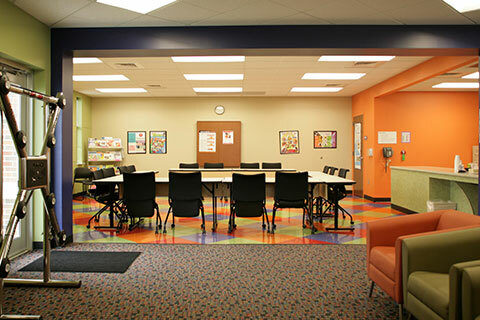 The center houses a hands-on library with interactive computers, games, and resources; a full-size kitchen for teaching parents how to cook for children with diabetes; and a multi-purpose room for classroom activities such as learning, training, and hands-on food prep for children. Located on Labette’s Parsons, KS hospital campus, the 1,750 SF stand-alone building is positioned for easy access by doctors, clinical dietitians, and other medical staff members.